Ah, a beautiful film and a terrifying one at the same time. I remember when I first saw it, I was surprised by the stillness of it; it gives the impression that perhaps the camera isn't there at all; there's hardly any camera movement. But then, at one point, there's a(n almost) close up, the only one in the film as far as I can recall (please correct me if I'm wrong), and it's one of those moments that draw you in unexpectedly, that are extremely effective because of the almost imperceptible change. Cemetery of Splendor is, in this sense, a sort of opposite to Malick's latest collaborations with Lubezki (Knight of Cups, especially) where the camera is in a constant movement and tries to represent the weightlessness of spiritual states by making it look as if the camera weren't rooted in space at all. Both Malick and Weerasethakul, I guess, are reaching for a world beyond this one, but they do it with techniques that are completely different. Weerasethakul’s version of cinematic protest is passionate but oblique. What is ailing the soldiers is revealed before too long: in what seems a bizarre literalization of Stephen Dedalus’s quip that “history is a nightmare from which I am trying to awake,” it turns out that ancient kings, who once lived, warred with one another, and died in this area, have commandeered the life-force of soldiers, and are using them to continue their endless war in the invisible realm of the spirits. The symbolism of his central conceit—patriotic Thais struggling unsuccessfully to wake up, vampiric autocrats sucking the life out of their subjects—is clear enough, though the film itself treats it so concretely, and with such patient attention, that it’s easy to forget. The boogeyman lurking just outside the frame is the Thai government, a military dictatorship since the May 2014 coup and none-too-tolerant before that. “I see no future in being a soldier,” says Itt, in one of his interludes of consciousness; he’d rather be a baker. But it isn’t up to him, and soon after he says this he falls back asleep. Also, a nice article on and interview with Weerasethakul from Film Comment. It's a wonderful film. Not surprising since Apichatpong hasn't made a bad film yet. 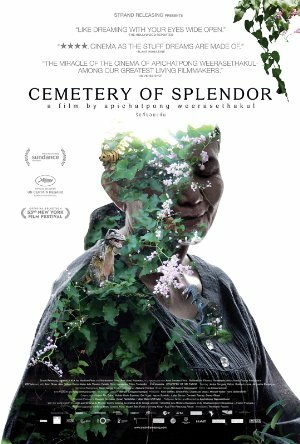 I watched this before the election heated up, so now a lot of it is a little blurry in memory, but I wanted to echo your point on how subtle Apichatpong is with metaphor. It's always there and right in front of you, but his films are so gentle and, as you say, patient, that it simply becomes enmeshed with the experience of life he shows. The metaphoric level isn't subtext or text in that way, just another layer to life. The character's interactions with minor deities and the unconscious soldiers too are a layering of what is present in life, but is simultaneously not "there". The dry sense of humor and pleasure in his films and minimal active conflict distance the more dramatic elements of life and art to focus more on the mundane activities that constitute the most of our existence. Which is, partly, what makes watching his movies feel so peaceful, even while there is that undercurrent of metaphor speaking to bigger issues and even when we might not fully understand or appreciate what's going on in the movies at first glance. They draw you into the world of the film and its character's first, and then, if you're interested, you might start to untangle some of the other layers that co-exist with the mundane. I've long believed that Apichatpong is the great non-literary filmmaker. Non-literary in the sense his movies don't follow a storyline as in most books or movies, and because they seem to almost not be written, just inhabited. The emphasis isn't on ideas as expressed in words, or perhaps not even ideas at all in the usual sense, so they don't fit the same models of discursive rationality we normally might expect to find in movies. They instead rely on non-discursive logic, which is something like an emotional logic, but one that isn't understood via easily named emotions, like anger, sorrow, joy, or the like, but through aesthetic "rightness" or just the feeling it all makes sense and that what we're shown follows an ineffable logic that results in gestalt. At least that's how it is for me and at least a few other Apichatpong fans anyway.